Together we knew that this project could be done. Now, there were only a few hitches left to deal with. One, to create an organization; two, to find a place to build a shipyard; three, to find someone who could build the ship and four; try to figure out how to finance the whole thing. I would like to tell anyone who would like to set up something similar that the technique of running this or any project is very simple. You define the starting point and your end point and then you split the distance in-between in small steps, and then you just get going, one step at a time. 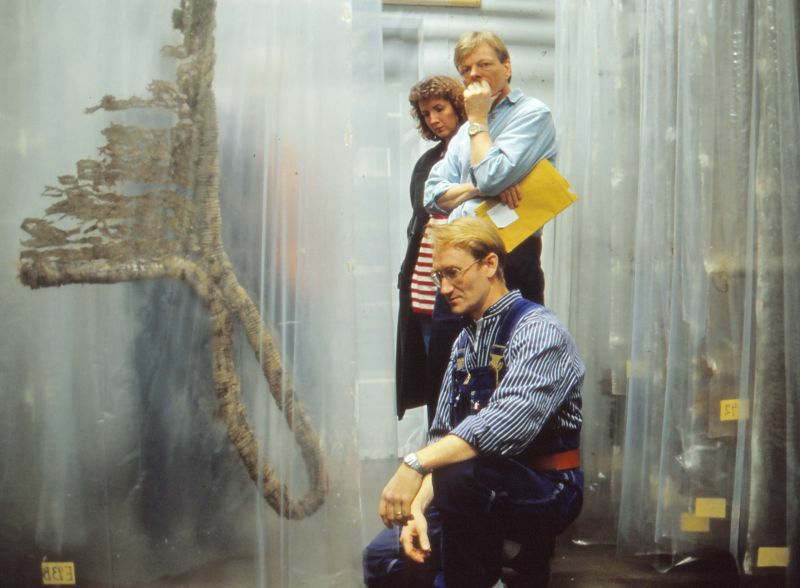 In 1993 the interest from the public in the East Indiaman Gotheborg III project is overwhelming. The number of members of the Friends organization counted into the thousands and the Swedish business and industrial community inside and outside of Sweden was well aware of the project. All were in favor and excited by the possibilities. Thousands of large and small corporations and organizations that had already in many ways contributed towards the excavation promised further support along the way. In February 1994 around 130 different companies had signed up for some kind of sponsorship. All who could see a current or a future value in the project were asked to support it - short term or long term. By this, the project grew together with the Sponsor's interests and undertakings. In five years, this method got the shipyard built and the project fully started. The larger Swedish export companies remained however cautious. So our first mission would need to be to get the project going and prove that it could and would be continued to a successful end. Basically, if we could hold out until we had proved this could be done, the support would be granted. This is a page from the first formal presentation brochure I made for the project, 'Invitation to Sponsors' brochure from February 1994. The organization was almost completely without hierarchy. Missing here are many who came into the project later on. I am in particular thinking all those who were working with hull, sail making and rigging period as well as our blacksmith, Berth Johansson and his team. A complete list of all who contributed years of their life would name several thousand persons over the years. After the excavation period was formally finished, in 1992 a completely new organization was set up for a new and free standing continuation. At this time the only legal entity that had any interest in this project except ourself as private persons was the Friends of the East Indiaman Gotheborg Organization. With Erik Wettergren, the well reputed owner of the Wettergrens book stores as a Chairman and Berit Wästfelt as secretary, the 'Friends' enthusiastically turned their support towards the new purpose and also decide to fund a feasibility plan and the drafting of the future organization. Next was to try to find a number of key specialists that would be willing to volunteer their expertise and become the core Management Group. The members would individually be responsible for each their own part of the project. They would need to do this for free as long as it was needed without any compensation except that they would be allowed to be in the project when and if it could be brought to bear, and that would only depend on ourself. In this Berit Wästfelts expertise as a former HR manager was put into good use. Her judgment was the sharpest I have ever seen. This is mid February, in the winter, 1993. 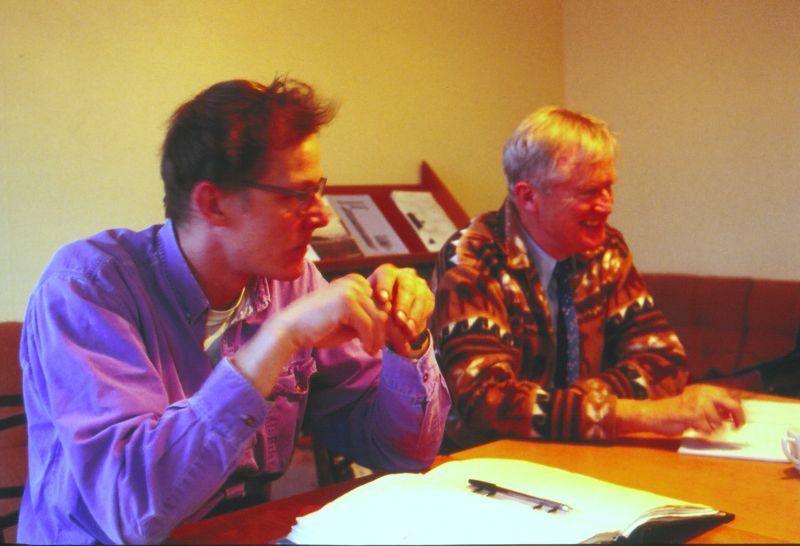 From left to right, Eric Lincoln (ship's systems) and Gunnar Angert (shipyard planning). The original members of the Management Group volunteered to make the early and crucially important contributions to the project. Some just turned up, like for example Gunnar Angert who walked up to us at the yearly Maritime Exhibition at Svenska Mässan and presented himself. He had a history at Eriksbergs shipyard when it was an important part of the Swedish Shipbuilding industry, and together with Anders Wästfelt drew up the plan for the Terra Nova Shipyard. Erik Lincoln, was at the time studying Ships Engineering at Chalmers and created the first plan on how the Ships technical systems could be fitted into an 18th century hull while still being up to acceptable modern standard. During the winter of 1992/93 we had set up an exhibition at the Maritime Museum in Stockholm and Anders also went there to give a lecture. At that time we also visited the Vasa museum. Partly because it was interesting to see a wooden ship of roughly the size of what we had in mind, but also to see what information we could gather on the subject of historic ship's building from this ship. Olof Pipping was at this this time employed by the Vasa Museum to reconstruct the rigging of the Vasa. Behind him, Björn Ahlander, our most crucially needed rigging expert. To give us an idea of what we were up to, Olof showed us a parts of the original sails found on board the Vasa. Vasa was however more then 100 years older than the Gotheborg, was intended as a warship and, did not really work out all that well, so the differences compared to what we wanted to accomplish were significant. Photo: Jan-Erik Nilsson, The Vasa Museum, Stockholm 1992. Olof Pipping volunteered as our expert in Historic Rigging and drew up the general rigging assemblage. Göran Svenningson would work with the ship's Interior Design. Lena von Sydow had been taking care of the book keeping for the previous excavation project was would continue this work here. Erik Wettergren, was Chairman of the 'Friends of the Gotheborg' Organization and would also function as the Chairman in our management group. Anders Wästfelt, the ultimate initiator would concentrate on Marketing of the project and organize the sponsorship reward programs and public activities. Berit Wästfelt, formerly HR manager at the Gothenburg Östra Hospital was a given for HR administration here too, and myself, Jan-Erik Nilsson who participated in practice as the professional marketing and business consultant I was, and in the project also doubled as responsible for historic authenticity and conceptualization of the values we would create. Eventually I also became the project's 'IT guru' as my awareness of the new 'Internet' grew and I realized its potential for future trade and communication, and how well that fitted with the project. Another early member was Bert Johnsson, the blacksmith who built his own Smedja Volund directly on the shipyard area, and without whose hand welding of thousands of iron details, not available in any other way, we would have been completely stuck. I still remember how he approached us the first time and said, - You might think that the ships of yours, that you want to build, is mostly wood, but you will not believe how much iron that will go into it. And every single piece will need to be made by hand, since nothing of this is available in the shops any more. He was very right. Björn Ahlander, our eventually most crucially needed rigging expert. What he together with his colleagues would do in recreating the rigging of the East Indiaman Gotheborg so that it not only looked right, but was also possible to safely sail and navigate with was nothing short of a miracle. Well, so was a lot of other things too but looking at the rig, that is a piece of art. 'Café Nova', run by Eva Carlsson, the favorite caterer from the excavation would also follow to the new project. A complete list of all who contributed years of their life would name several thousand persons over the years. The 5 November 1993 we were done with the planning and had put together all documents with consistent project objectives and prepared all formalities to get on with the next step in setting up the formal structure of the project. We needed a clear non-profit owner to which we could direct all funds and donations and we needed a formal corporation where you could hire staff and actually build the ship. To this end we created The East Indiaman Götheborg III Foundation to assume the overall responsibility for the project and to become the beneficiary of the donations that would be needed to fund the project. All members of the Friends organization and all former sponsors were invited to become Founding Fathers and to resume the sole responsibility to oversee the activities of the foundation, and to that end to have the right to select the members of the Board of Directors of this Foundation, every year, at an annual meeting. More than 40 friends and sponsors showed up and signed the founding papers, and at the same time elected the first Board of Directors. This original group of Forty Founding Fathers who at this time put their names on the foundation documents were from now on to be called The Founders of the project. This group of about forty persons were also the ones that would have the final say and deciding power on how the project were to be run through their power to select the Board of Directors of the Foundation on a yearly meeting. Immediately following the founding meeting we went ahead with creating the company that were to build the ship. After having set up the Board of Directors to the company too, we went ahead and registered it. As luck would have it the old Swedish East India Company SOIC AB was available why this became the obvious choice of names. As for persons to man the Boards of both the Foundation and the Company, we had looked for the most well connected and respected names we could find, willing to join in on this project. The 28 December 1993 the Friends donated the funds necessary for us to register the The Swedish East India Company AB as a fully owned company to build the ship. We then donated these 100 percent of the shares of the SOIC AB to the Foundation that so far did not have any other capital. We had now created what we felt was a good organization for a non-profit project that would be solid and also be able to handle substantial amounts of money. In the purpose document of the various bodies were clearly stated their various purpose. The ultimate power rested with the Forty Founding Fathers in that they would be there to select who were going to be in the Board of Directors of the Foundation, once every year. The purpose of the Foundation was to put it bluntly, to organize the money and to sign sponsorship contracts. This body would then support the company SOIC AB in their work to build the boat. The SOIC AB were then supposed to hire the Management Group to run the project as soon as there were any money available for that. The Friends organization would support the project directly by help and donations if and when needed. As for workers and some staff, Berit had got an arrangement with the Regional Board of Labour (Länsarbetsnämnden) that we could sign up and use a certain number of people that could work for us but got paid by the Regional Board of Labour. In this arrangement there were however no resources left for the managing of anything, why Berit herself was left out of pay. What we had not been able to foresee was that there would be no money available for the Management Group until December 1998. The reason for this was simple, that there is no way to find sponsors for a ship that does not exist, and the number of visitors that would like to pay to see an empty spot where a shipyard should be is also very limited. If there were ever to be any money in this project is was up to us who started it, to make that happen. Erik Wettergren was the first of the Gothenburg profiles who dared to volunteer as the first CEO of our newly established Swedish East India Company AB. I would say that it was his firm personal conviction combined with his solid reputation as a serious and competent Gothenburg businessman that made many of our early supporters trust that this could actually be done. In early 1995 Bo Alfredsson step up to become the second CEO of our new company and by securing some larger sponsors lead it to some firmer ground. In 1996 the heavy industry steps in and the former shipyard manager Erkki Persson took over the leadership of the ship building part of the project. He also added professional knowledge in how to have a ship approved and classed for sailing. From 1996 the focus of the project were changed. Leadership as well as management were turned more into the hands of traditional industry. The manager in charge of this development was the former head of the Eriksberg Shipyard AB and eventually the entire Svenska Varv Group Bengt Tengroth, who had also been the one that originally had lent Anders Wästfelt the land for our East Indiaman project, and also an ear to the complex visions on how the project could be utilized in a wider perspective, and finally organizing much of the funds needed to realize the project in the way it finally came to be. For much of the attention the project early on got in Asia the great personal interest and help put in by Bengt Johansson, then at the Swedish Ministry of Foreign Affairs and later, Swedish Consul General in Shanghai, and Anita Johnson, Swedish Trade Council, must be remembered. The enthusiasm and assistance given by the former Professor of History, Jörgen Weibull and Professor Bo Gyllensvärd, regarding the Swedish interest of Chinese culture throughout the history as well as regarding the Chinese porcelain cargo of the original Gotheborg, was extremely important. Among all this one special thought would need to go to the local newspaper GP whose unending support from the excavation phase and onwards by giving the project a public voice was critically important, and to Volvo AB to whom I personally wrote the first letter of information by the end of 1993 and still in my archive, starting with "Dear Sir, I have the pleasure of informing you of the upcoming project of building a full scale sailing replica of the East Indiaman Gotheborg which foundered and sank just outside the harbor of Gothenburg the 12th of September 1745… ". Our optimism was rewarded by an unending support that soon granted us the use of two Volvo cars for necessary transportations and the promise that they would supply the ship with two Marine Engines, once it was built. Many important individuals also very early lent their names to the different Boards of the project. One of these were the then current Province Governor, Landshouml;vding Kjell A. Mattsson, who took the Chairmanship in the foundation we had registered to be the main and central owner of the entire project. The Chairman of the company SOIC AB that we created to build the ship and the shipyard, was Bengt Tengroth, who early realized the value of the project and lent out a large piece of the old Erikbergs shipyard area to us, where we could build our ship. Still as always, nothing would have happened without the help of hundreds of volunteers were they divers, amateur archaeologists, archive researchers, tidying up the shipyard area, made sandwiches or maybe just gave us a smile when all were tired. The gratitude that should be granted to all and everybody involved in this visionary and exciting project is immense. I have here only been able to mention a fraction of those I personally know have contributed their support. It is my hope that in time all and everybody's efforts will be properly recognized. This page is one of currently about 1,500 Gotheborg.com GLOSSARY, Q&A, Exhibition or other INFO pages available on Gotheborg.com. This ship section contains a few of the original pages that was created by me during 1996-2000 in the early phase of the Rebuilding and China Voyage East Indiaman Gotheborg III Project and a number of follow up texts about what happened later. The reason for the name of this my web site - Gotheborg.com - is because of me being, mainly together with Anders and Berit Wästfelt, one of the few original volunteer co-founders that actually started the Gotheborg III project as described here. The project was a difficult thing to get off the ground (or into the sea) and after that, I kind of retired out of sheer exhaustion. I was head of historical research and conceptualization, and my intention was to use the ship to promote the use of Internet as a communication, business and network platform. My idea was to use the ship to market the website, not the other way around. This was completely not understood at the time but have been done by others by now, like Amazon, Facebook, Linkedin, eBay etc, and a few gizmoz that have not been done yet. But at the time, there were then no use for the domain name, so I kept it and decided to use it for my other personal interest and hobby - the study of Chinese export porcelain and our mutual history of trade and cultural exchange. All expressed opinions and observations are my own if not stated otherwise. Submitted material gratefully appears on this website due to the implied or expressed consent of the rights owners. All text and images are copyright © Jan-Erik Nilsson, Gothenburg, Sweden 1996-2019 unless otherwise stated. A larger screen allows larger images and better navigation. So it goes.